Encrypt and decrypt any file or plain text in over 85 different ciphers. Is there a better alternative to Universal Encryptor? Is Universal Encryptor really the best app in Security category? Will Universal Encryptor work good on macOS 10.13.4? 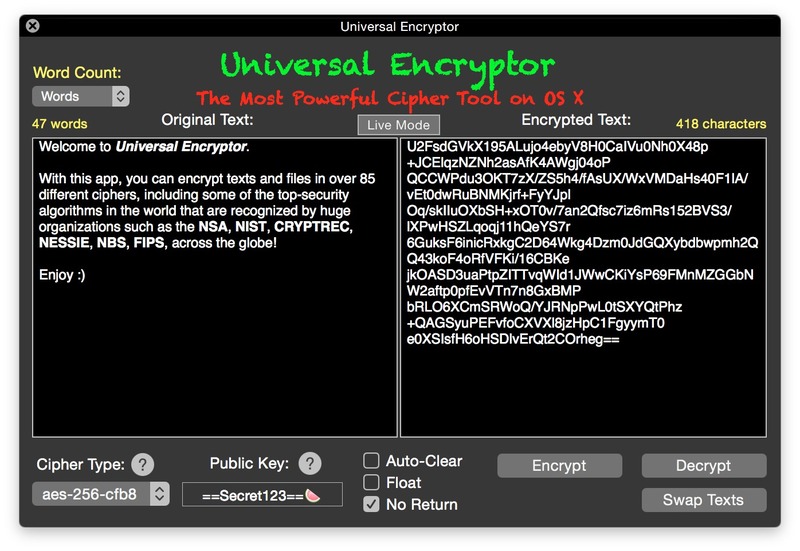 Universal Encryptor is an app designed to encipher plain text (utf8 encoding) and files(uses the extension .upf, stands for universal private file) into a randomly generated cipher, with a corresponding passphrase embedded in the code. The app itself can decrypt its own codes. Without knowing the cipher type and the passphrase (case sensitive) you cannot decrypt the text. Try it out with your friends! Email the developer at 10127051@mybcis.cn with a request for an activation code -- it's completely free. Due to time difference it might take a maximum of 12 hours for a reply. Authors note: Please keep Universal Encryptor opened at all times until you receive your activation code. The code changes every time you relaunch the application. Thank you for your support.